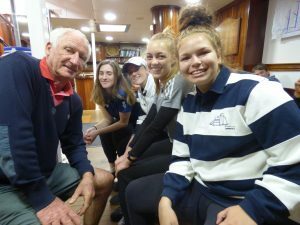 Leeuwin’s oldest sailing volunteer, Peter Graham, has achieved international recognition this week after being awarded Sail Training Volunteer of the Year (Over 25) at the Sail Training International awards in Spain. At 77, he continues to amaze staff, volunteers and trainees alike, all of whom decades younger, with his willingness to climb to the highest points in STS Leeuwin’s rig, his agility around the ship and his extraordinary capacity to motivate and lead his watch groups. Pete has been an extraordinary asset to Leeuwin for over 10 years and we can’t thank him enough!